There must be some occasions when you want to edit your favorite DVD movies to make some modifications. Adobe Premiere Pro/CS/Element are professional video editing software with powerful video editing features. If you have got Adobe Premiere and want to edit a DVD, you will definitely use Adobe Premiere as the DVD editing tool. Though Adobe Premiere supports lots of video and audio format, such as 3GP, 3G2, ASF, DV-AVI, DV, FLV/F4V, M4V, MOV, MP4, MPEG, MPE, MPG, WMV, etc. etc. it doesn't support DVD importing like most video editing software. If you want to import DVD to Adobe Premiere for editing, you need a DVD converter to rip and convert the DVD files to Adobe Premiere compatible video formats first. It is recommended to convert DVD to DV-AVI or MPEG, which are highly compatible with Adobe Premiere. To do that, you can use Aimersoft best DVD converter software, a professional DVD ripping software to rip DVD to Adobe Premiere supported video format and almost any video format like MKV, MOV, AVI, WMV, MP4, MOV, FLV, etc. with fast ripping speed and high output video quality bypassing DVD CSS protection. The Mac DVD to Adobe Premiere converter version is Aimersoft DVD Ripper for Mac. Get the right version according to your needs and check out the step by step guide to rip/convert DVD to Adobe Premiere editable video files easily and fast. This guide takes the Windows version screenshots for example. The way to rip DVD to Adobe Premiere on Mac OS X is the same. Just make sure you get the right version. 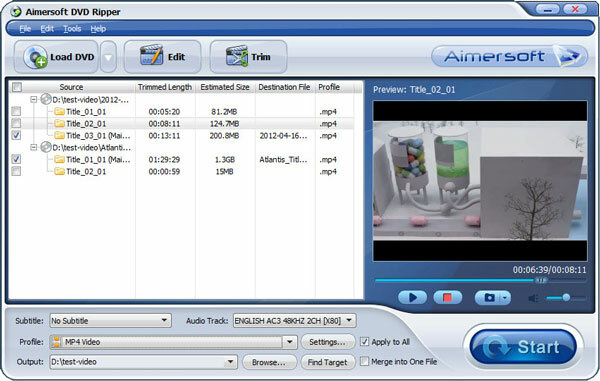 Launch Aimersoft DVD Ripper and click "Load DVD" to add DVD files from your hard drive. As you can see, you can freely preview the DVD on the right viewing window and take snapshots of your favorite scenes. 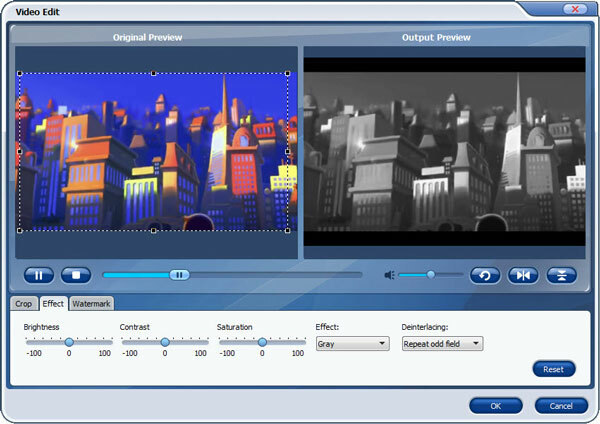 If you'd like to edit the DVD movie, you can click the Edit button to enter the Edit windows(Including Windows 8) and do some editing like cropping, trimming, rotating, adding video effects, etc. Set the output path to save the converted videos and choose the output format. To edit the video in Adobe Premiere, you can choose the output as DV or MPEG (Recommended) from "Common Video"
When all is OK, simply click "Start" to begin the ripping. The conversion will finish soon if your DVD movie is not too large. After the conversion finished, you can get the videos highly compatible with Adobe Premiere. Just Launch Adobe Premiere and import the converted videos to it and enjoy home video editing! One of the best video editing software that is based on a timeline is Adobe Premiere. Created by Adobe Systems, this professional video format is widely used not just in many Hollywood movies like Monsters and Captain Abu Raed, but also by the BBC broadcasters for The Tonight Show. Adobe Premiere is currently the most popular software in its genre. This is because it works seamlessly with the other Adobe products like the After Effects, Photoshop, Adobe Story, Adobe OnLocation, Adobe Encore, and Adobe Prelude. There are now several versions of the Adobe Premiere, with the latest one being the Adobe Premiere Pro CC 7.0.1. This particular version is compatible with both Windows and Mac OS X computers and boasts of a range of features that would definitely put your best footage forward. The biggest leap of new Adobe Premiere Pro CC is its cloud computing integration. As such, it allows the most hassle-free system updates and file synchronization, while easily sharing your work among all the computers on the network. The software also sports a redesigned timeline that comes complete with intuitive video track targeting and a clever copy and paste attribute. As a professional video editing software, Adobe Premiere Pro CC runs the Mercury playback engine and supports closed captioning, high fidelity interchange, sync settings, multi camera editing, world-class effects, project browsing, multiple GPU export, broad format, enhanced monitoring, and end-to-end metadata workflow.